Plans for a Broadway version of The Wedding Singer, the 1998 film comedy starring Drew Barrymore and Adam Sandler, have been announced. The movie centres on a wedding band singer who has been jilted by his fiancee but dreams of finding love. The soundtrack included Sandler's character covering 1980s pop songs by the likes of Madonna. No casting has been announced for the stage version, which is set to open in New York in April 2006. The musical will have its world premiere in Seattle in January before a short run. It will then transfer to New York at a venue yet to be announced. The Wedding Singer was a box office hit, starting when it made $21.9m (£11.6m) in its opening weekend in the US and Canada. The film marked Sandler's breakthrough after cult hits like Happy Gilmore and Billy Madison. An ex-member of the Saturday Night Live US TV comedy team, Sandler has since starred in box office hits Big Daddy, Little Nicky and Anger Management. He showed a more serious side in 2002 when he played a small businessman prone to violent outbursts in Punch-Drunk Love. 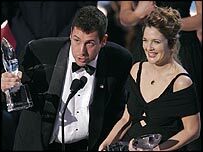 Sandler was reunited with Charlie's Angels star Barrymore last year in 50 First Dates. The pairing worked again with audiences, taking $41m (£21.7m) in north America in its opening weekend. Sandler will next be seen starring alongside Burt Reynolds, Chris Rock and rapper Nelly in American football comedy The Longest Yard, due to be released in the US in May.